The Mint water additive is only for dogs. The Chicken and Original flavor will both work for dogs and cats. 【 A TRUSTED COMPANY 】As fellow pet owner's and lovers we understand the importance of safe products for our furry little friends, that's why our products are made and tested in our laboratories here in North America. Our water additive is Notified under Health Canada's rigorous VHP (Veterinary Health Products) program. Many other pet oral care brands do not comply with Health Canada's regulations. Our mission is to make sure we are looking out for your pets' long term health. 【 ENJOY YOUR DOG'S KISSES AGAIN 】 Although loving affection from your pet can be one of the joys in life, one with bad breath can ruin your day. By simply adding our breath freshener water additive to your pet's water, you can easily enjoy their kisses within just a few days. Kissing aside, did you know that the main indicator of dental problems is bad breath? Our water additive not only freshens breath but helps fight plaque and tartar as well. 【 A TASTE YOUR PET WILL ENJOY 】With our water bowl additive you will be surprised at how enjoyable it is for your pet. If you're looking for the best dog gifts of 2018, then why not surprise them with this great pet friendly product. Your pet or pet lover will be thrilled to receive this dog present for their birthday or even as a Christmas present for dogs. Find out today why customers are choosing bluestem for their pet gifts. 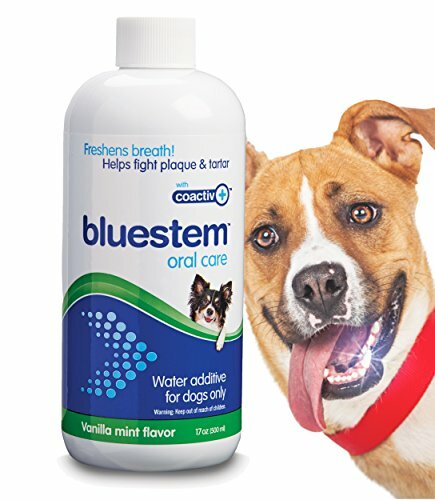 【 HELPS PREVENT PLAQUE AND TARTAR 】bluestem has been proven to help reduce tartar without brushing by up to 25.4%*. According to the American Veterinary Dental Society, 80% of all dogs and cats will suffer from dental problems by the age of 3. Did you know that dental disease is the most preventable illness in pets? When you establish a daily routine of dental health using a water additive that your pets will love, you are providing a healthier future. *Study summary available upon request. 【 SAFE FOR DOGS ONLY 】 Our water additive is safe for your pet. A safety study concluded that there was no evidence of adverse effects related to the consumption of the water additive*. Other additives on the market may contain unsafe ingredients. Our food-grade ingredients are alcohol-free, xylitol-free, chlorhexidine-free, and sugar-free. They DO NOT contain any surfactants or detergents, making our water additive safe for your pet no matter it's size. *Study summary available upon request. If you have any questions about this product by Bluestem, contact us by completing and submitting the form below. If you are looking for a specif part number, please include it with your message.